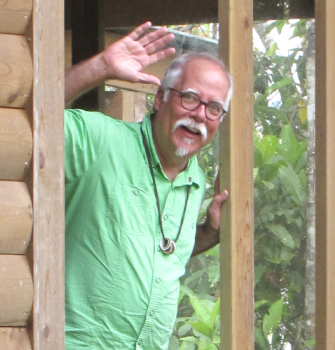 A guest “Viewpoint” written by Greg Homer, a birder’s birder who has led many trips to Costa Rica over the years. Greg and his wife Helen are our newest members. . . . .
It’s possible — even probable — that in the entire history of the world no non-birder has ever uttered the phrase “Ooh look, a Thrushlike Schiffornis!”. But this wonderful creature, described by field guide author Richard Garrigues as “. . . a non-descript olive-brown bird . . . ” and somewhat more generously by the great Alexander Skutch as ” . . . not brightly colored”, is most definitely a joy to behold when seen by a birder. Greg Homer, on deck at his new digs near the Wilson Botanical Garden. Toucans, motmots, most parrots and many tanagers fall into a category of birds often referred to as Charismatic Avifauna (C.A.). These birds are so colorful and/or charming that both birders and non-birders alike stop what they’re doing to give them a look. It’s extremely easy to love a Bay-headed Tanager or Fiery-billed Aracari. But the Thrushlike Schiffornis most certainly does NOT fall into the C.A. category. Not only is the Thrushlike Schiffornis non-descript and not brightly colored, it does not live a particularly exciting or charismatic lifestyle (at least not to all of us non-Thrushlike Schiffornises). The terms ‘sluggish’ and ‘secretive’ and ‘solitary’ are often used to describe its behavior. The song of the Thrushlike Schiffornis is unlikely to ever become a Top 10 ringtone. And, on top of all that, there is the name — to me, ‘Thrushlike Schiffornis’ sounds more like a medical diagnosis than a bird. When I was a kid back in the citrus belt of California, family, friends and neighbors used to look at me, smile and then tell my parents, “Well, there’s a face only a mother could love.” And so it goes for the Thrushlike Schiffornis — a bird only a birder could love. This entry was posted in Viewpoints and tagged birder's bird, Birding San Vito, Thrushlike Schiffornis, Wilson Botanical Garden by AWOlivieri. Bookmark the permalink.